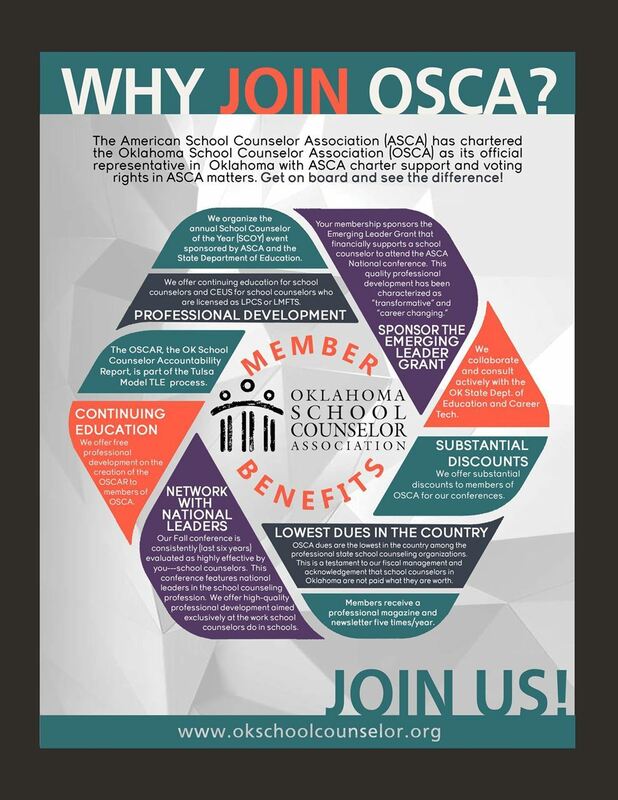 A professional membership in Oklahoma School Counselor Association is just $25/year. You can join online or by downloading our Membership Application and mailing it with your payment. Join Online by completing the online application. Our system accepts all major credit cards, or a paper application may be submitted with payment by check. Affiliate - $25.00 (USD) Subscription period: 1 year No automatically recurring payments Members who have an interest in school counseling but do not qualify for a professional membership may enroll as an affiliate member. Affiliate members are not eligible to vote. Professional - $25.00 (USD) Subscription period: 1 year No automatically recurring payments School counseling professionals who hold a master’s degree or higher in school counseling or the substantial equivalent and are employed as school counselors, supervisors of school counselors, or professors of counseling in a graduate program that prepares school counselors are eligible for Professional membership. Retired - $25.00 (USD) Subscription period: 1 year No automatically recurring payments Professional members in retirement are eligible for Retired membership. Student - $25.00 (USD) Subscription period: 1 year No automatically recurring payments Students enrolled in a master’s level program that prepares school counselors are eligible for Student membership.